Promo codes allow you to give customers a discount on Meeting Rooms and Desks, as well Online Plans. When a customer enters a Promo Code at the Check Out, the discount will apply to the main product on the package e.g. the membership, virtual service but not to additional products or setup fee and deposit. How do I set up a Promo Code? To set up a Promo code enter "Promo Codes" into the global search or go Portal> Promo Codes. Alternatively, hover over Portal, in the main navigation menu, then select Promo Codes. Click on the New button to create a new code. Enter a Code Name. This is the text that customers will enter to receive their discount. Add a description for the Promotion. This will only be visible to you and your staff. Set the number of Promo Codes that you want to issue. This will determine the number of times this code can be used. If this is set to 0, the promo code option will not appear to customers at check out. 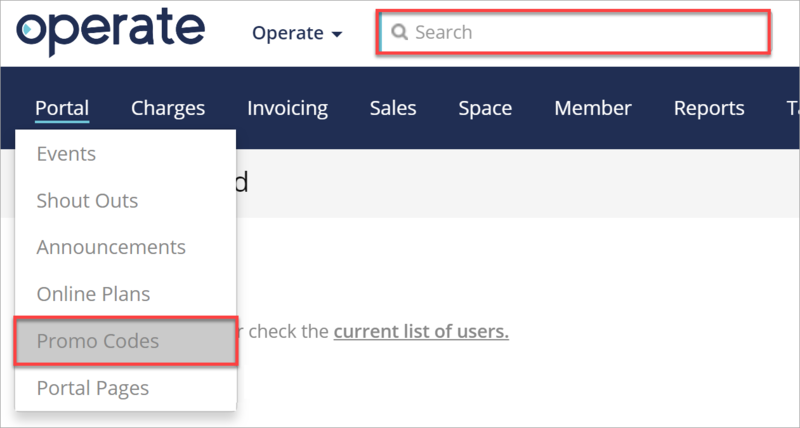 Add a Valid From and a Valid To date. This is the date range that the Promotional Code is valid for. The code can only be used within this date. Set the Discount Type: by Percentage % or by Amount, and enter the Discount Amount. Click on the Save button to save your Promo Code. Where can customers find the Promo Code? You can choose how to distribute your Promo Code. You could issue the code to select customers in direct communications (for example newsletters, emails), or display it to a wider audience on your website. How can customers use their Promo Codes? 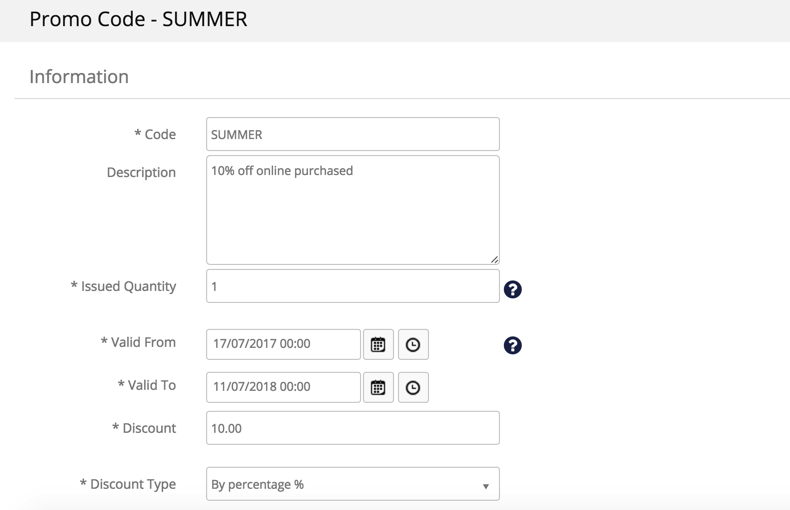 When checking out, if there is a Promo Code with a date range that matches the current date, users will see a box prompting them to enter a code. After entering the code and selecting Apply, the discount will be applied to their order summary.